THESE “BOOTS” COMPLETELY ENCLOSE THE HEAD PORTION OF THE ROD END AND ARE HELD IN PLACE BY THE MOUNTING BOLT. 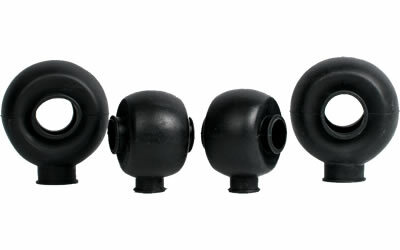 THE BOOT IS DESIGNED TO COMPLETELY PROTECT THE ROD END FROM ALL TYPES OF CONTAMINATION. IN SEVERE DUTY APPLICATIONS, INSPECT REGULARLY FOR ANY OPENINGS THAT WOULD ALLOW DIRT AND WATER TO ENTER. STANDARD PACKAGE CONTAINS SIX BOOTS.